Surgery on July 22nd. They will go in and remove Gertie... then they will have a pathologist in the operating room and will examine her to double check and make sure that she is in fact cancerous (to rule out a false positive from the Fine needle biopsy) If for some reason it is not Cancer like they thought they will stop there... only removing one side (right side) of my thyroid sew me up and send me on my way. If it is positive and come out with the same results of cancer like the FNB then they will continue on and also remove the left side of my thyroid. It should be an out patient procedure and I should be able to go home that night. One month later I will have to take a radioactive iodine treatment (a mild form of chemo) During which I will need to be isolated from everyone for 3-5 days. Sounds like fun?!?! NO! lol! Patients with thyroid diseases and thyroid cancers write and submit letters to their thyroids beginning with Dear Thyroid, of course, among other literary things.. 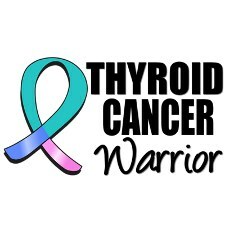 This site maintains current information about thyroid cancer and support services available to people at any stage of testing, treatment, or lifelong monitoring for thyroid cancer, as well as their caregivers.